When you stepped into the Art House through the front door, you walked over a “buckle” in the floor and started heading downhill. There was a 2″ drop as you crossed from the living room into the kitchen. It was so pronounced that I was able to place a marble at the top of the “hill” and watch it slowly roll to the bottom. The house was built in 1901 on a “pier and post” foundation, a style of building that utilizes cement footers with 8″ square posts that hold up the framework of beams and floor joists. The town of Bucoda sits in a river valley that floods every 40 years or so. 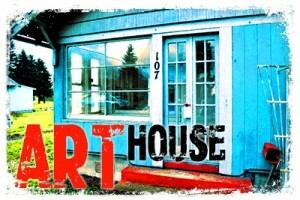 The Art House sits on the very edge of town and has avoided the flood waters each time; but the soil can be soft and crumbly and subject to sinking and shifting. Considering the age of the house and the condition of the soil, I suspected that one or more of the piers on the south east side of the house had sunk. Shoring up the piers was essential before I could move ahead with any other repairs on the house. The new pier on the left is in the spot where the old post had completely rotted away. At this point, you can see the old post lifted off its cement footing. Two of the new piers and posts in final position. 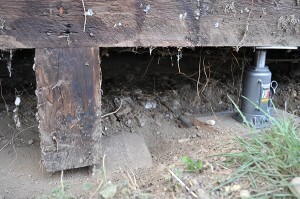 I began by removing the cement boards that covered the open foundation and discovered it was worse that I first thought. One of the piers was completely rotted away and a second was in the process. No wonder the floor was sinking! 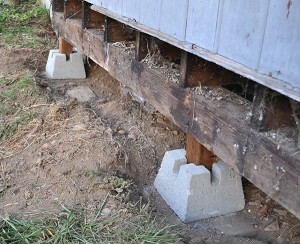 I used gravel and wooden blocks to stabilize the dirt and then inserted three 12-ton bottle jacks under the outer beam. I made sure to place a steel plate between the piston and the beam (otherwise, the piston would puncture the beam – multiplying the problem). Alternating from one to the other, I slowly lifted the house until the piers were no longer holding up the house. I knocked them loose and inserted three new cement bases in their place, along with three new posts (cut from 4×4″ pressure treated lumber). 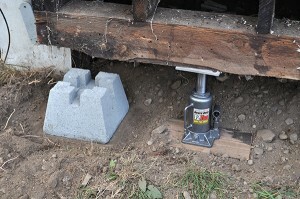 It took some pushing and pounding to get them into position, but after that, I released the pressure on the jacks and dropped the house onto its new piers. You can still feel the buckle in the living room floor when you walk over it. But the 2″ slope has been removed and the foundation is back to full strength. That’s one more important project checked off the list! This entry was posted in Art HouseBookmark the permalink. Post a comment or leave a trackback: Trackback URL.